This caught my eye today and affected me enough to break my longtime ban on paying for a copy of the mainstream news. Personally, I am for the legalisation of active euthanasia because I strongly believe that pain and suffering is a personal and private experience and one has the very right to choose to either terminate it or go through it til the very end. No one should deny patient who is terminally ill the option to end the pain and suffering. No one should expect the patient to accept hospice care and painkillers. I do understand the concerns that many have with regards to what might happen should active euthanasia be legalised. I will explore the concerns along with my suggestions. It will be great if a discussion can generate here. Assisted death should not take place without a final verbal or gestural confirmation from the patient at all. There should be chances for the patient to change his/ her mind even til the last second. I definitely think that in her case (and in many other terminal illness cases like hers) active euthanasia should be allowed. 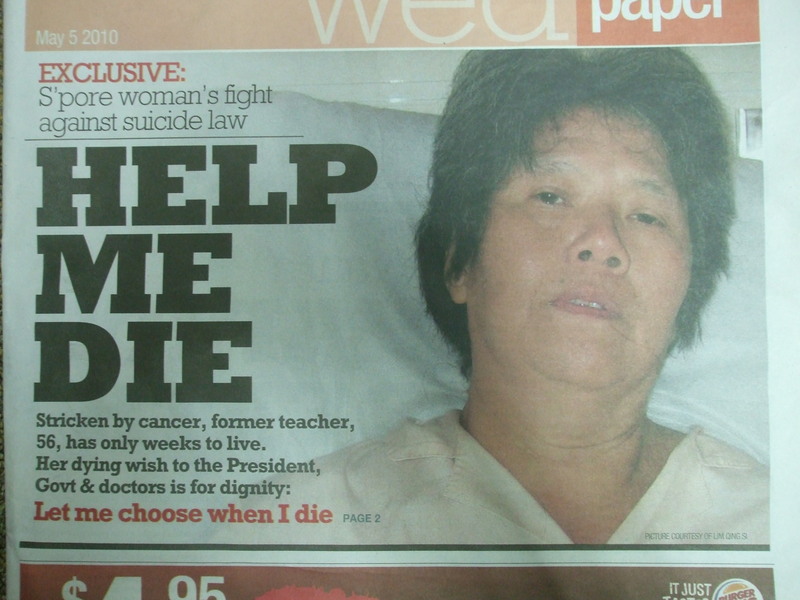 What is the point of letting her suffer physically and emotionally day by day just because we are clinging on to the social norms that tell us that assisted suicide is wrong? When faced with such a situation as Mdm Lim’s, I’m sure she isn’t at all comforted by the fact that we refuse to let her die because we are holding on to some ideological beliefs. She wants to end her life in peace and wants to do it legally so no one will get in trouble after she is gone. Seeing her current plight, I say that is a reasonable request. People need to understand that legalising active euthanasia does not automatically mean that we are condoning suicide or are against preservation of life. It is simply leaving the option open for those terminally ill and suffering patients; this is the last choice they will ever be able to make in this world, and we should not refuse them just because it makes us uncomfortable to think about the issue. I worked in a hospice myself in the early 90s as a ‘friend’ and ‘counsellor’ and have also encountered a similar case such as that referred to above. She, however, with the support of the nuns running the home (St. Joseph’s Home, Jurong), chose ‘life as long as it lasted’. Others whom i attended to achieved much in appreciating the meaning of life and accepting the next stage of their ‘evolution’ prior to death. It is these experiences that made me averse to a simple legislation in favour of euthanasia without stringent checks. However, the society that we breed through our self-absorption, greed, etc, would itself serve as the foundation upon which euthanasia might be ab/used. Hence, besides legislation, we ought to be pushing for a more caring and sharing society – which confucian/advanced capitalist states can never be. Quite the quandary isn’t it. I have spent the last two precious years of my life working on my project to promote dying with dignity (I am nearing 70 and a victim of lung cancer. thus the “Precious”). Stories like this always appall me. When and how will we move forward on the need to help the elderly? Social workers will not understand fully about the emotional struggle and agony that the patient goes through. Explain this point. I don’t recall making this point here specifically… but anyway, I do personally think that nobody can completely understand what another human being is/ may be going through especially in the event of sickness, depression and facing death. Social workers are no exceptions. Hi there! I thoroughly enjoyed the post, you’ve pointed out some interesting points on euthanasia. I too, support active euthanasia. I believe that everyone has the right to their decision to die with dignity. Hope you can share some love into my campaign and support the page. My campaign is about voluntary euthanasia, aim to change attitudes towards euthanasia and raise awareness into the issue that the younger demographic have not considered. Many patients suffering from incurable diseases must endure painful treatments without the choice to decide, whether they would want to end their life painlessly or continue enduring through treatments until they pass.